The thing about mental illness is that even when you have good days, good months, good years, there always exists somewhere in you the fear of the if, or the when, it might or will all crumble again. 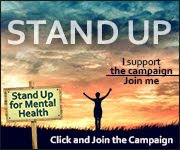 Just as a quick brief, the mental health issues that grace “my” diagnosis rap sheet, severe depression, social anxiety disorder, manic depression (bipolar disorder) and schizophrenia, are mostly misdiagnosis' - depending on who you ask, I suppose. It took several years of being a pharmaceutical guinea pig, over and over, before coming to terms with the “problem” in this brain. It is fractured, and was at a very very young age. It is fractured into different people; different people with different feelings, different wants and desires, different interests, different memories. Different entities, sometimes at odds, wanting different lives. They are more cohesive now, the memories, than they have ever been. But that took both understanding, and time. While it is not always easy, we have learned to communicate with each other in order to try to live a more stable existence than we had in the past, separated, fragmented, and dangerous to one another. It probably sounds strange, it probably sounds...who knows, maybe dumb or unbelievable to you. Who knows. It's not really like it's portrayed in movies either. Just as there isn't anybody who knows how your mind works, or has not had the experiences you've had, or seen the things you have, neither have you of anybody else's. What most people call multiple personality disorder is actually known as dissociative identity disorder, and is not a personality disorder, rather a dissociative disorder. Everybody at some time experiences a little dissociation. Those who have a history of trauma and abuse experience more severe forms, occasionally for some, often for others life disrupting in nature. People with dissociative identity disorder may be considered fractured by some, but they are not broken. It is simply the function of a protective brain at a young age of development. There have been several times throughout the lives shared in this body where, seemingly unexpectedly, the strives that had been made to remain at the top, to stay mentally healthy, were dashed. Looking back on each time, the signs were all there, despite being blind to them at the time. It is the err of the human, really. Hindsight is always the teacher, as long as you pay attention in class. Four years ago this past June was the last time it happened, and it months of a downward spiral followed. The only clear memory of the moment it all tipped over the edge and the months of madness ensued, was the end of September 2010. We moved out of the house we owned in the city where we lived at the time, renting it out (which ended up being a disaster twice over) and moving closer to the more urban part of the center of the city. The house was too big, and having no car, despite being very close to the center of the city, it felt isolating. It required several trips with a moving van, taken during the day. Most of the people we knew at the time were at work, so it had to be done alone. Back and forth across town, up and down the elevator of the building we moved into, box after box of books, kitchen supplies, small furniture. For whatever reason we were frustrated, sad, angry – not uncommon for us, actually. It was hard on our back, which was riddled with a plethora of issues because of a bad car accident six years before involving a semi-truck. We had just ended a two year relationship a few weeks back, a relief really, but a change none-the-less. We were moving to a new area, a hipper more urban part of the city with a nightlife right out the front door. We should have been more excited. Pulling one of the final boxes from the van, a large wooden case of poker chips fell out and spilled all over the alley next to the apartment building. Crying, kneeling in the dirty alley, we grabbed at the chips, which just seemed to keep multiplying. Like all the pieces we were picking up on the ground, we broke. Exhausted, sobbing, we sat in the dirt, head in hands. We hit the breaking point. After that day everything changed fast. It took several months to scratch our way back to being mentally healthy, days, nights, screaming and sobbing on the apartment floor, sobbing on the living room floor, breathing in the dirty carpet fibers. Sometimes drunk, sometimes sober - punctuated by days and nights of stupid unwise decisions. We lost some great friends (and not so great ones). We lost a good job. We lost our mind. We looked totally together on the outside, save the weekend night when we would wander around the neighborhood, the grocery store, the video store, drinking white wine from a back metal water bottle. The paranoid in us closed the blinds, which stayed closed for months on end. We shut ourselves in, and shut everyone else out, save a few specific people, new friends who were helping us through this, who meant the world to us. We had managed to come out of the fog. It took vanquishing our core, sending her away; she is never allowed back again, she was the weak link, as far as many of us were concerned. A year later, October 2011, we were on the move again, this time going back to the states, new boyfriend from England in tow. Even though the relationship involved mutual sacrifices, his love for us, all of us, was a giant Band-Aid. We met James through social media. He had read our blog, he knew all the dirty vile things we were capable of. He knew how our brain was fractured. He started following our Twitter account and we became friends. We never thought we could be truly loved by another person again. He knew that a relationship with us was never going to be easy. Some of us loathed him. Eight months later, we married so we could continue being together in the States. It may not be “perfect”, sometimes he doesn’t feel as loved as he deserves to, sometimes, some of us, feel caged, but at some point in life it becomes clear that no relationships are ever easy, they all take work, and commitment. Four years later, we live in a small town with James, in a house bought after the sale of the house we owned in Canada, that took over a year to find, and many struggles to get through. We are not social with the people in the town. From our many experiences, a product of moving nearly twenty times as an adult, people are temporary. We still don’t like leaving the house very often, but we have to, occasionally it causes anxiety, but there are ways to deal with that. However, we still try to travel, because life is short, and living a life being a slave to anxieties and fears, is no way to live. We have a good paying part time job in a city nearby with people that are nice, and have just finished the first two semesters of university (with exemplary grades), upon returning to secondary education after a five years. There is only one year left to go and we will have a second degree (one in culinary arts, one in communications). It will have taken almost twelve years to finish the degree we started in 2003. Physically we’ll be pushing 36 years old when graduation comes, but the achievement will be worth it. In our spare time we paint, and garden, and read, and spend a lot of time on social media where we have met some amazing people. Despite still experiencing mental health issues from time to time, we have learned how to manage them fairly well, and have had a really good couple of years. We will have been off of all medications for four years this June, and hope never to go back to them. Always lingering is the fear, it suddenly pops back in the head when things feel like they are going extra well. On the 40 minute commute to work or school. The falls that led to the gamut of diagnoses’…the final fall that lead to this place. Will there be another? Will there be another relapse? It does no good worrying about it, some might say. But all of the times we have come out of it, stronger, we have pushed forward, forgotten about it, thinking arrogantly that we will never be “sick” again…and then hairline cracks form, we refuse to recognize them. Then they spread, and they weaken the vessel. Then life gives us a small bump, and suddenly we are picking up the chips in the dirt, with tear-stained cheeks. It’s mental health month. Another month to bring awareness to something people are already aware of; but awareness means nothing without understanding, just as you can no more understand the life of a bird by simply being aware of its existence. You probably know someone with a mental health issue. You may have one yourself. You may develop one in the future. So please remember: the mental illness is not the person; it is a burdensome accessory people are yoked with. People with mental illness get a bad rap in the media, beneath feigned concern, as if they need that extra struggle of harsh judgment because their brain works differently. Many of the people who deal with mental health issues have been through hell and back, they fight to come out on top, to be employable, to have normal relationships, to be productive…sometimes over and over again. Even if they don’t, even if their struggle seems too great to be able to manage employment, manage “normal”, they just need support and encouragement. People are capable of overcoming so much, if only they believe in themselves, and have the support from people they care about. Next time you are quick to judge, take a step back from yourself, and put yourself in their shoes, and see how you like being judged because of the footwear you didn't choose. This month, do more than be aware. Try to understand. I find it ironic the hardest month for me just happens to be MHAM. Thank you for this post. After living with a mother who had a borderline personality disorder, I can identify with your crazy stories (which are equally terrifying at the time). Carrying my own smorgasbord of issues, I realize that mental health is a tough thing to carry. Isn't it better knowing that a sense redemption is lingering on the horizon?